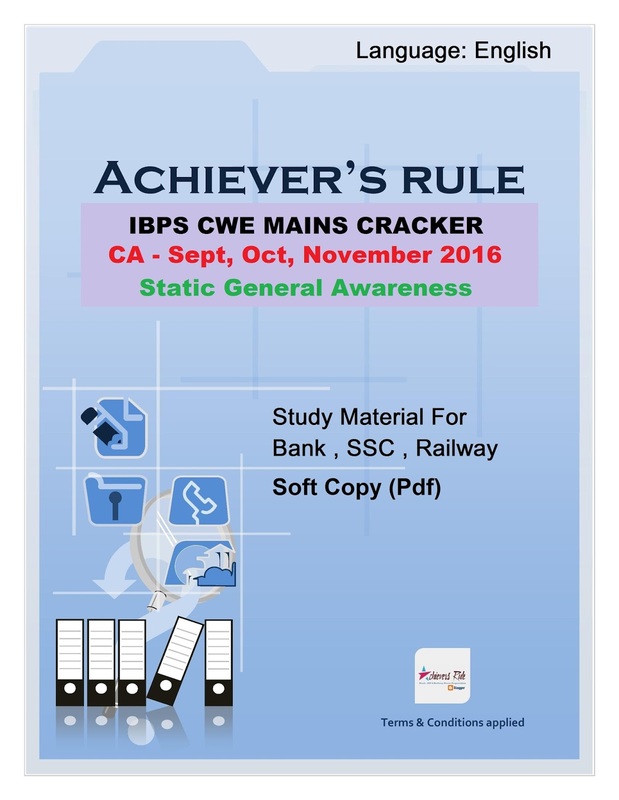 As Many Candidates Asked to provide 3 Months Current Affair for Upcoming Mains Exams for IBPS CWE CLERK 2016, etc. Finally Our Team Launched the Capsule. Candidates are requested to pay a very small amount of Rs. 69/- . Here we will mention all the Highlights of this capsule. Important: We Request All Our Readers to go through this capsule line by line. Each & every points is important for you to score a Good Marks. "IBPS CWE MAINS CRACKER 2016"
Current Affair - September , October & November 2016 with updated Facts. Covered all Important Facts & Figures. Highlight Topics also mentioned in this capsule. Special Guidelines by Our Experts. Note: This Capsule is Purely Prepared by Our Experts who cracked IBPS PO 2015 & SBI PO 2015.